On Sunday I had friends around for lunch and I made this delicious bread and butter pudding cake that I found HERE. Even though I am okay with some lactose and wheat, you may not be so I have translated it into a low Fodmap version. It is so simple to make that it is worth keeping this one in your repertoire of delicious recipes. Preheat oven to 150C. Grease and line a 23cm springform cake pan with baking paper. Line a baking tray with paper towel. Put cake pan on prepared tray. Combine raisins and cranberries in a large bowl. Slice the bread and spread butter on one side of each slice of bread. Line base of cake pan with bread, butter side down. Sprinkle a half of the fruit mix over brioche. Top with another layer of bread and fruit. Repeat once more, finishing with a layer of bread. Whisk eggs, cream, milk, sugar and vanilla in a large bowl. Slowly pour egg mixture over pudding, allowing it to seep in. Stand for 30 minutes. A small amount of liquid will drizzle from cake pan and be absorbed by paper towel. Discard paper towel and rinse tray. Replace cake pan on tray. Bake pudding for 75 minutes or until a skewer comes out clean when inserted in the centre. Stand for 15 minutes. Release clamp on cake pan and transfer pudding to a wire rack to cool. Serve warm or cold with whipped cream. please use ounces, pounds and, Fahrenheit. what is low-Fodmap bread and caster sugar? If you are interested in the recipe, there are great conversion tables on the internet to help you. 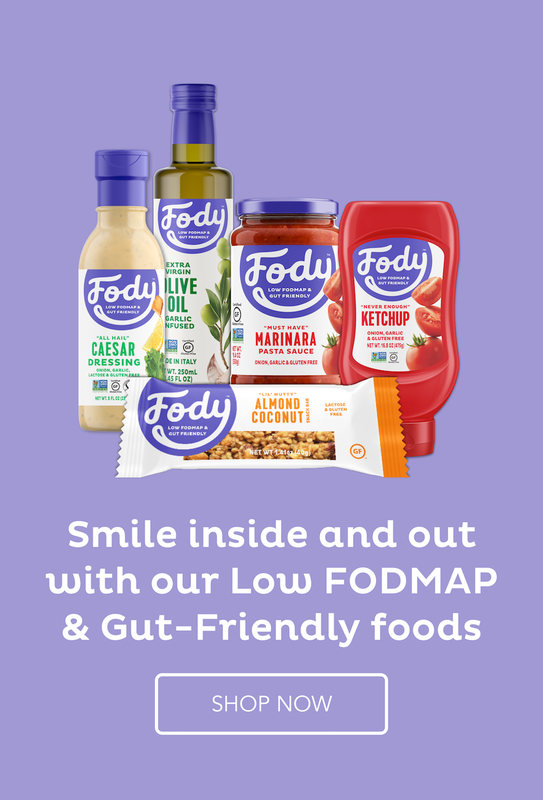 Caster sugar is fine table sugar, while low Fodmap bread is a gluten-free bread that is also low Fodmap – with no high Fodmap flours like soya, coconut or almond, and is also free of all other high Fodmap ingredients. Hi Suzanne – Thanks for the explanation for Americans! I will keep these comments on hand so that I remember what caster sugar is. Also, have you made the low FODMAP version? Was it as good as the original? I use sourdough bread almost exclusively as it tastes so much better than gluten-free bread. I don’t know the science behind why using sourdough makes the wheat OK for us with IBS, but I’m really happy it does. I assume it would be acceptable in this recipe? I haven’t made the low Fodmap version but I am sure it will be pretty good because the custard gets absorbed into the bread in the same way. Traditional sourdough bread is prepared over two days and has no yeast. The reason why we can use normal wheat flour is because over the two days the wheat ferments, which is what makes the bread rise even though there is no yeast. Since that fermentation has happened outside the body, it won’t happen inside and is safe. Many brands use the name sourdough but they have sped up the process with yeast and so the wheat has not had time to ferment completely. That is high Fodmap bread. Look for a sourdough bread with no yeast.